This is an auto-changing mister that features a 16mm ceramic disc size. It's one of our lowest priced replacement misters, so if you are looking for an economical replacement, or something just to try out, you have landed in the right spot. The DH-24 Mister is a good replacement part for nearly any model of misting fountain you may need to fix, but can also be used as a part to make your own creation. All you need to do is submerge it in water for it to produce mist. 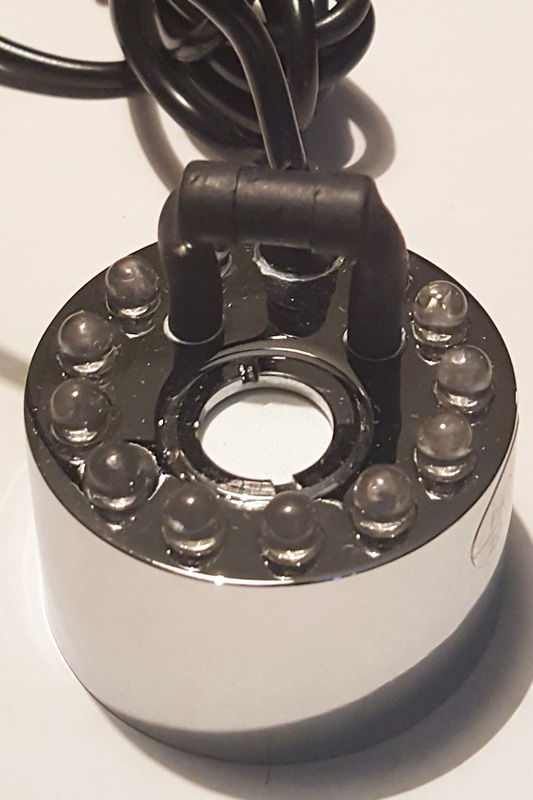 It does come with the little rubber stopper pre-installed on the cord to plug the hole in your glass fountain bowl, but the cord can also go over the top of any other container you might want to use. This model features auto changing lights, and that is the main difference when compared to other models we carry. This aspect does not affect performance or longevity, but it does allow you to pay a lower price to get things working again. 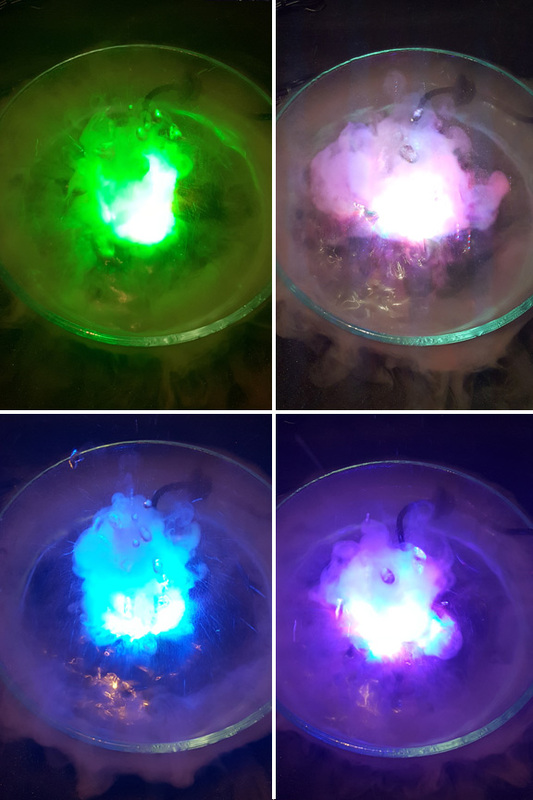 12 LED lights line the top of the mist maker, and they will rotate colors automatically while the natural cloud is produced. Make a unique and efficient humidifier for any room, or fix your broken mist fountain with this high quality part. 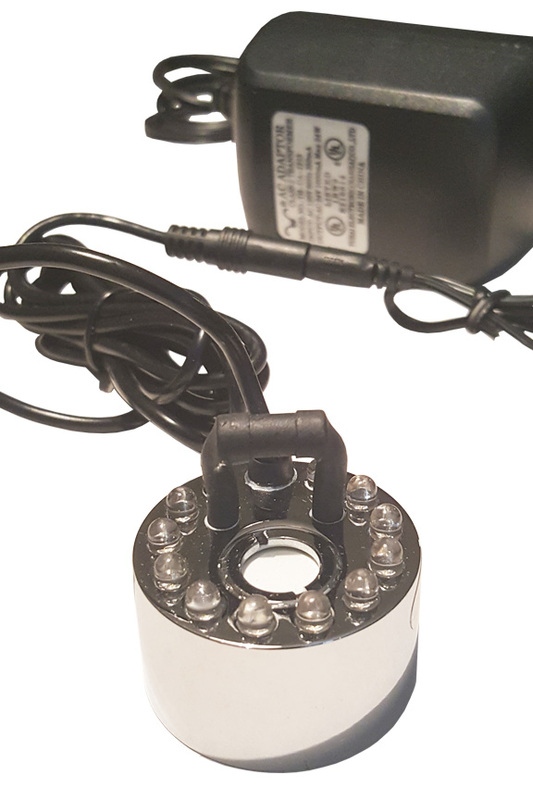 16mm disc with 70 ml/hr output. Auto-changing lighting with 16 lighting modes. This small device produces a psychological feeling of calm and well being, and has the added benefit of generating negative ions which help to clean the air of impurities. It also increases the humidity in a room, which can help sufferers of colds, sore throats and asthma. Increased humidity can also be very beneficial to indoor plants. An Ionizer, Humidifier and Aromatherapy Diffuser all in one. Order Yours Today! DH-24 Replacement Mister - Repair a broken fountain or make your own with this replacement misting device kit. Submerge into any bowl of water to produce a natural cloud of mist that humidifies the room. Order Yours Today! I have been using misters for years, lots of different brands. This mister works better than most. It puts out a good mist and the lights make it look nice. Great, getting ready to order another one different size for my larger mister. Thank you. So far, so good but it appears this unit lasts about a year ( I've bought 2 in the last 2 years). The mister I purchased works great and am happy to have it. Shipping was quick once the item was no longer on backorder. Happy with my purchase. The ordered item was a great solution for my clock with the water pump. Thanks team. Got just what I wanted. Works great and nice to see I can get a replacement when needed. Thank You. This replacement mister unit works beautifully. My plants are so happy to have it working again! Love my misters....my plants love them...my skin loves them..i have missed tbe beauty and moisture in my home..thank you!!! It is so good that I can order replacement parts and get them less than a wk later ..Simply Good Stuff ..your great !!! The mister and power pack were just great, did exactly what I wanted. Would recommend it to anyone. It's great ! My plants love the mister! The DH-24B Mister works really well and looks great, but it produces at least twice the amount of water with a much stronger stream than the original mister. As a result, the floor beneath the mister becomes soaking wet from the mist within an hour of operation, even though my mister fountain has a large diameter, deep bowl. I find this mister to be unsuitable for indoor use. I got this little jewel for a Halloween prop I wanted to avoid dry ice. This does the trick very well. I was surprised at how well the unit was made it appears quits solid. What a treat. WE LOVE OUR MISTER - VERY PRETTY AND HELPS KEEP MOISTURE IN THE AIR. The mister is easy to install and it works as expected. Very good product. This mister is the best! A lot of power making a lot of mist. Makes my misting machine look completely different with the changing colors. Great service and delivery. Just what I needed. When my old mister konked out I first tried a new ceramic disk but that was not what was wrong. They suggested replacing the unit with this one so that is what I did. It was very easy to install and worked on the first try. So happy I got it! Love my mister adapter works great.Thanks for great products and great prices!! Love, love, love it. We origanally bought our mister at the goodwill. It worked perfectly for about 6 months. Found Simplygoodstuff on-line, ordered the replacement mister and we are so very happy. Works great again. Fast and easy to order. Great customer service, will definetly be a customer for a long time. Thank you. I love both products I have received from you. Yhe last item was a replacement of the mister (lights). My first one stopped working correctly, and I had to replace it. Since using this new one every day for the past month, everything is working fine. I love both products I have received from you. Fog mister is superb. Lights, which previous one lacked, adds visual appeal to fountain. Excellent product for the cost. I looked a long time but this was perfect! It was easy to install and works beautifully. Just picked up this item at the border yesterday. Plugged it in and it worked. Looks ok. The old one had stopped making mist. Was going to throw everything away, but the new mister will make it last longer. The problem is after I ordered the mister, I broke my lotus bowl so now my mister if of no use to me. I attempted to order a new lotus bowl but you have had them on back order for a long time. Will you be getting some in the near future? The product works fine, price was fine, and the service from Simply Good Stuff was great. It's exactly as I ordered. I am always satisfied with everything that I have ordered. I asked the on line question regarding which pump to buy to replace the pump in my mister fountain and they replied promptly. I ordered the item and it came quickly and cheaper than anywhere else. Easy installation and it is working great! Very p;eased with this part and it has such pretty colors too. I ordered this mister as a replacement for the original. It works great. This is not your plastic mister. This product is substantial and weighty. The base is not plastic and will stay put in your fountain. The colors are vivid and the unit mists extremely well. Simply Good stuff is a reputable company that treats their customers very well. Their delivery is spot on, and they stay in touch with their customers. Great company to deal with. This is a replacement for the original fogger/mister unit that stopped working. I like this unit more than the original because the fogger is stronger and the assorted color lights give a better affect. works as good as new so far, I use one a lot in the office, gets lots of ooooh where did you get that???? very cool! my only complaint is the cord to the ac/adapter is much shorter than the original so I could not put the mister on the shelf I would like it to be. This is an excellent product at a very reasonable price. I am very well pleased with the product and the good service that I received. I will definitely order again if the need should arise. Does this mister have an on/off switch or must it be unplugged to turn it off and plugged in to turn it on? This model does not have an on/off switch. You plug it in to turn it on, and unplug it when you want it off. How do I order one item, not 3? We do not require a purchase qty of three. You can get as few, or as many as you want. In the cart, you can change quantity, by changing the number in the box, and then pressing the update button next to the box. You can also press the "X" button to delete the product, and then start over by adding just one. If you need help placing this order, please give us a call. What is the big difference between the JAS-20 mister and the CH24 Mister?.. I want the fog and the mist. All of the misters will have the fog and lights. One of the main differences in the more expensive options is that they will be controllable. The JAS-20 has auto-rotating lighting modes, but the CH-24 has a control button to set the mode you like best. 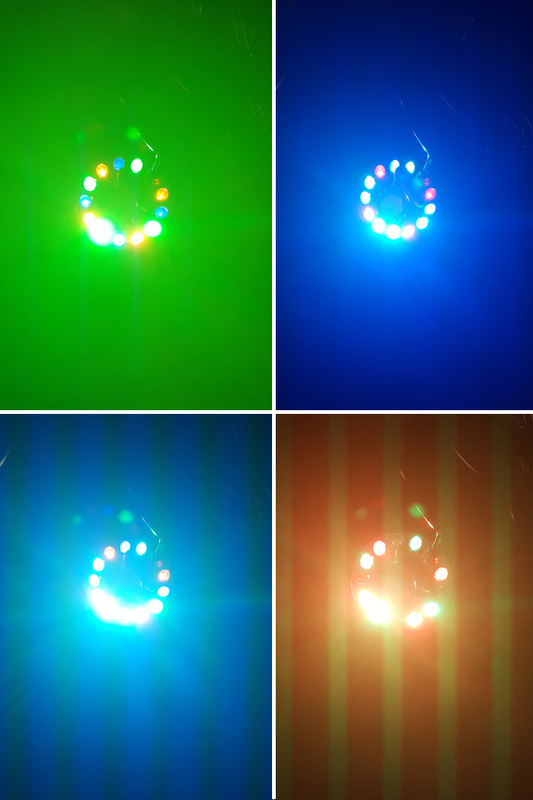 When the lights still work, but the unit stops misting, a new ceramic disc can often fix the problem. They do wear with use, and they are required for mist production. Also, If using oil in the water, or if your water is hard, cleaning can improve performance when the mist slows, or stops completely. Use only a damp cloth to clean. No soap or other products. Does the DH-24B model have the mist control on it? No. There is no control on this model. This unit does not come with an outdoor rated AC adapter. Our pond foggers are basically the same thing, only bigger, and they have adapters that work outside without modification. how much watter has to be under the mister?